Gardeners, like everyone, are too short on time and money to waste either on plants that only look good for a few weeks. You want hardworking, eye-catching plants that provide beauty for multiple seasons. 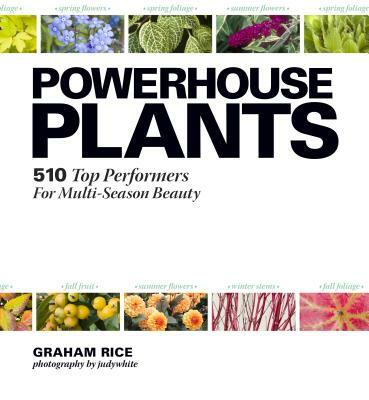 You want powerhouse plants—plants with colorful spring flowers and summer fruits, or summer fruits and fall foliage, or summer flowers, fall foliage and winter stems...or any combination of two or more of these desirable features. Like flowering dogwood that boasts summer flowers and fall fruit and foliage. Or honeysuckle that has fragrant spring flowers, summer and fall foliage, and fall fruit. judywhite is author and photographer of the award-winning Taylor's Guide to Orchids (Houghton Mifflin 1996). A past trustee of the American Orchid Society (AOS), she has earned its highest prize for writing about orchid culture, as well as the AOS Silver Medal for outstanding service to the orchid community. Her photography has graced many books and publications, and has been exhibited at the Smithsonian Institution. A former research biologist and past editor-in-chief of one of the world's first mega-gardening Web sites, Time Life's Virtual Garden, judywhite is married to British garden writer Graham Rice. She is proud to say she has killed orchids on both sides of the Atlantic. Visit her Web site at www.gardenphotos.com.